Exotic lands and their equally exotic food turn every tourist into an enthusiastic foodie; Sri Lanka is no different. Read on and discover mouth-watering treats you can’t afford to miss. Achcharu in Sinhalese refers to an amalgamation of various ingredients, a term also used to mean ‘you are in a pickle mate’. Well, like pickles, achcharu is a sweet, sour and spicy combination of half ripe fruits generously mixed with salt, sugar, chilli and vinegar. Favourite types of achcharu are mango, pineapple, lovi similar to olives and amberella like small sour mangoes. A very traditional fish dish, ambulthiyal is spicy, sour and full of flavour. It’s a dry curry made with generous amounts of chilli, pepper and gambooge or goraka. Blood fish, like tuna, is often the favoured type of fish, ambulthiyal is ideal to eat with a piece of milk rice and is often served at tourist villas in Sri Lanka offering traditional food. Oil cakes or kavum is a traditional sweet-meat made for the Sinhala New Year, a harvest time celebration taking place in April. Sweet-meats are not ‘meat’ based but honey drenched delights you will find rather hard to resist no matter the damage to your waistline. Kavum is made from kithul treacle and rice flour batter fried in coconut oil. 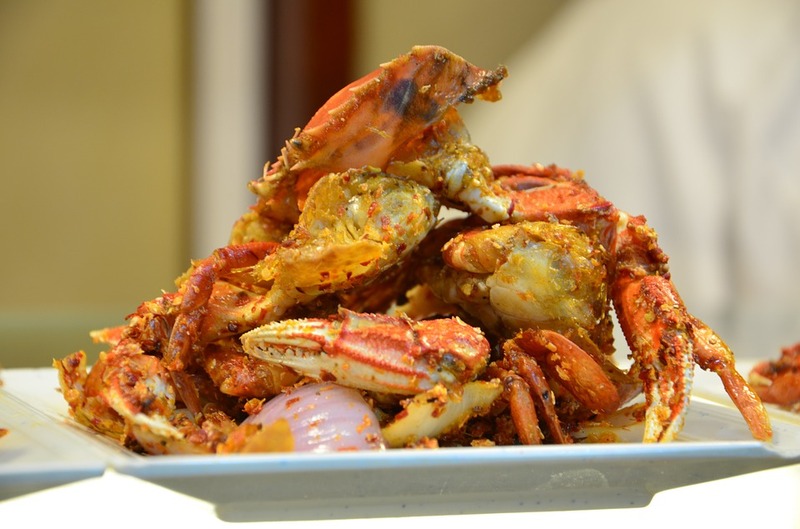 Lagoon crabs, like mud crabs, are the best, although sea-crabs too are popular in Sri Lanka. A traditional Sri Lankan crab curry, made with the correct blend of spices is a treat, all you need is a piece of toasty bread to mop up the thick gravy and loads of patience to dig out the sweet, succulent flesh from the shell. Hoppers or appa is a staple for breakfast or dinner. You can buy piping hot hoppers from roadside food kiosks and enjoy it with a side of spicy onion relish. Hoppers are shaped like a bowl with a soft centre and crispy sides. The batter is made with rice flour and thick coconut cream. There are loads more folks, do be adventurous and enjoy!